Discussion in 'Non OEM Ink & Cartridge Suppliers' started by William Seaward, Apr 1, 2018. I recently acquired some refillable cartridges with Arc chips and I having some difficulty with them OR better with 1 of them. I have an HP Designjet Z2100 and all of the cartridges work except for the yellow, it isn't recognized by the printer. Does anyone know of any steps that I can take to get this last cartridge working? did the yellow cartridge/chip work at all ? Or do you still have warranty ? The yellow chip never worked at all. I bought these off eBay... and 7 of the other chips worked just fine. They even sent me another chip, however, that chip didn't work either. I know very little about ARC chips, and I'm curious of there are ways to "reset" these. You cannot reset a non-working chip into a working condition, there may be other reasons like contact problems - electrical or mechanical. You may test that with a set or original cartridges. Such a chip stores the ink level data as they are written by the printer to the chip - from full to empty. And then the printer reports that it cannot recognize the chip anymore, you get the cartridge out, do the refill and re-insert the cartridge, and the chip resets itself at this time to full, not at any earlier time, you cannot reset an ARC chip from an arbitrary ink level to full wihtout passing through the zero-condition. There may be real resetters on the market for a few cartridge/chip types but they are not needed and won't give a functional benefit over the ARC chips. Artur5, William Seaward, The Hat and 1 other person like this. Did you try with another yellow cartridge ? Maybe the contacts are dirty or bent. PS: true resettable chips have the advantage you can top up all cartridges at once (to save on cleaning cycles), but if there are only ARC's available, you won't miss this since it isn't done with originals either. I have an OEM set and they all work. I tried using the OEM yellow with the others being ARC and it recognizes the yellow. The people I bought these from sent me another yellow chip and that is failing also, so I was hoping that there would be something I could do to initialize the yellow to being recognized... I don't think that is going to happen though. The people that I bought this from are not giving up though, as last night they were saying that there could be other options... I'll keep everyone posted as to the out come. they were saying that there could be other options..
yes, possibly, I'm not familiar with HP chips, but I know from Epson chips that they carry a manufacturing date code which makes it possible for the firmware to disable chips/cartridges too old and outside a particular datecode range. HP may do similar or other tricks. You may recognize differences between chips when viewed with a magnifier , some carry a very small version number on the little pc-board. Your OEM yellow is accepted, that's good to know that there are no contact problems. It's funny that you mention this, HP also carries a date code on their ink cartridges and print heads and the printer can disable these. Every time I fire up the printer, it tells me that the ink is expired and in some instances (unknown at this time but continuing to research) it will not let you print. This is where I had the bright (or dim, depending on how this turns out) idea to get the ARC chips on the ink cartridges where I can still use the "expired" ink (which sells very cheaply on eBay) without the printer shutting down OR making me confirm the "expired" ink each time I use the printer. So far, with the working ARC chips installed, it doesn't force me to confirm that the ink is "expired". The Hat, Ink stained Fingers and PeterBJ like this. Here's a couple of suggestions: Turn OFF Software Upgrade, some time down the road upgrade will turn off chips. Yellow seems to be a problem for years, chips or no chips. 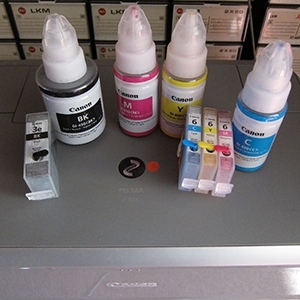 20+ years of Epson printers, yellow needed attention [cleaning nozzles, print heads]. I now use HP and refill, yellow is Full but shows Unknown, other colors fine. HP chips have problems which is why I do not use them. I spoke with a supplier in Hong Kong and was told HP chips not reliable and has discontinued them.